Eric Stanton (Dana Andrews) is asked to leave a bus because he doesn’t have the funds to travel any further. He finds a small diner and visits it frequently. There he meets Stella (Linda Darnell), the waitress at the diner. Eric is a con man. He’s really not a nice guy. He wants Stella and he believes that if he had money she would marry him. So, he marries June Mills (Alice Faye) for her money. Soon after they are married someone is murdered and Eric is a suspect. However, his new bride loves him, believes in him and supports him. He does some sleuthing and discovers the identity of the real killer. I like a good Noir film. I don’t really have a favorite but I do like Dana Andrews. Remember him??? Laura (1944) and Where the Sidewalk Ends (1950). The beginning of this film was questionable for me. I almost stopped watching it. I persevered and I was glad I did. It turned out to be a good movie and the ending was satisfying. 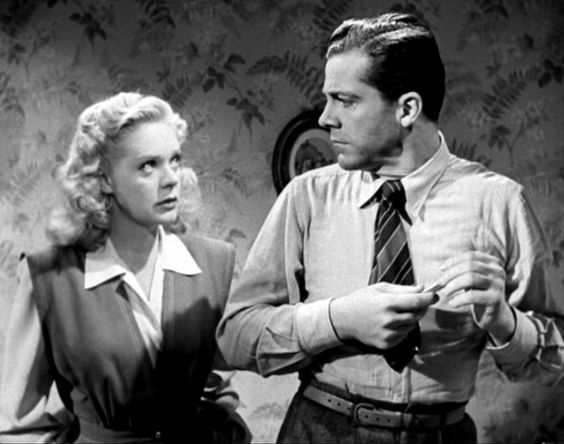 Dana Andrews was a cad in this film, but the woman he married (June) knew he married her for her money and she loved him anyway. She believed in him and saw what he could become. I felt sorry for the waitress (Stella). She’s a diamond in the rough. She was searching for a husband, home and family. That’s all she wanted. Her method of reaching said goal needed improvement. I didn’t know who the killer was??? It kept me guessing. I suspected everyone at least once. 🙂 Good film.